How much time you put in is up to you - all we ask is that you do as much as you can. Snow Warden duties are seasonal and at times you will need to be reactive to the weather conditions. What area you cover is up to you too. 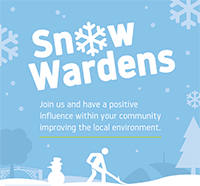 You can carry out your Snow Wardens duties on your own street, housing estate or local area. For more information about the scheme read our Snow Warden Leaflet. When signing up to become a Snow Warden we will contact you first of all to go through the role in more detail, provide any necessary training and answer any questions you may have. To support you in your role we will provide you with a high visibility vest, gloves, a snow shovel and rock salt (which you will be required to store at your home). During the winter months we will notify you regularly when we anticipate snow or freezing conditions so that you can be prepared. Volunteers will be given guidance on how to clear snow and ice safely. A short video showing how to effectively spread salt has been produced by Derbyshire County Council and further guidance can be found on the GOV.UK website. Whilst acting on behalf of the Council in this role, Snow Wardens will be covered as a volunteer under the Council's insurance policies. Volunteers will also be asked to confirm they are 'fit to participate', where they agree that they are fit and able to perform the duties of a Snow Warden.